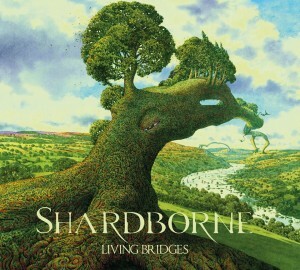 Limerick instrumental/progressive metallers SHARDBORNE have only just signed to their hometown label, Out On A Limb Records, and have wasted no time in getting the release of their debut “Living Bridges” album locked down. The release date for the album is the 10th July 2015 and will be available on heavyweight Double LP, CD and Digital formats. “Living Bridges was recorded by band mambers Ciaran Culhane and Ben Wanders. With mixing and mastering done by Jamie King. Renowned illustrator Duncan Storr [Skyclad] created the “Living Bridges” artwork. The album was recorded by the band’s Ben Wanders and Ciaran Culhane and went on to be mixed and mastered by producer Jamie King [Between the Buried and Me, Scale the Summit]. The album will be launched with a gig at Dolan’s Warehouse on July 11th, with further tour dates to be announced shortly. “Living Bridges” was recorded by Ciaran Culhane & Ben Wanders, mixed and mastered by Jamie King. With their current instrumental line-up being cemented in 2010, Shardborne went on to record and release debut EP Aeonian Sequence in 2011. The four-track introduction to the band, (now available for free download on Bandcamp), drew deserved attention and lauded Shardborne with raved reviews. “These Irish tech-proggers inhabit a similar space with their progressive instrumental riffage that falls between Atheist and BTBAM.” Commented Terrorizer Magazine about Aeonian Sequence. Honing their creative talent into a mesmerising and exciting live show the band then hit the road, touring both their native Ireland as well as the UK and mainland Europe, sharing the stage along the way with the likes of Cynic, Chimp Spanner and Russian Circles. Fast-forward to 2015 and Living Bridges is set to transport both Shardborne and fans to another plane of existence with its release on 10th July. The release will be supported by a launch gig in Dolan’s Warehouse Limerick and will be available on heavyweight double LP, CD, and digital format.